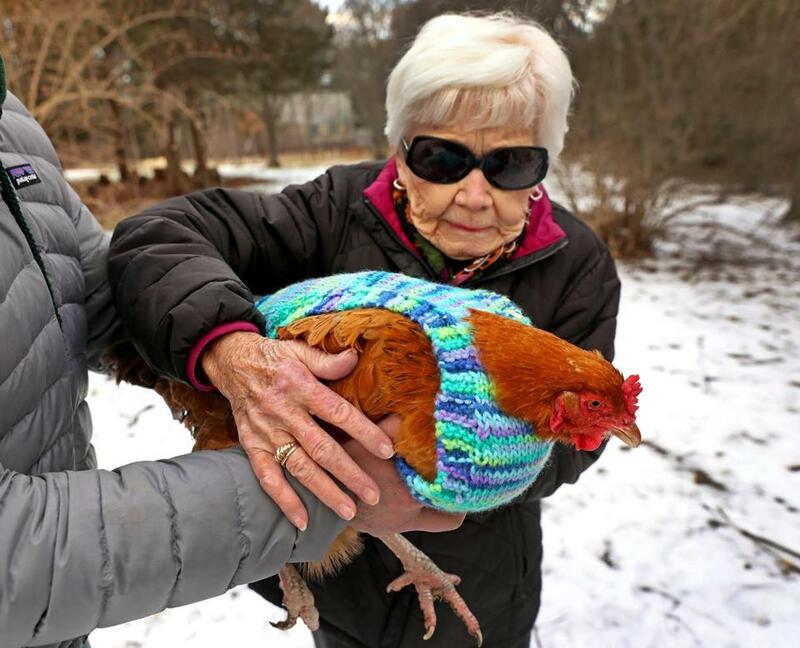 Rosemary Gelep learned how to hold a chicken wearing one of the sweaters she and other knitters from the Fuller Village housing complex in Milton made for the Wakefield Estate chickens, roosters, and hens. 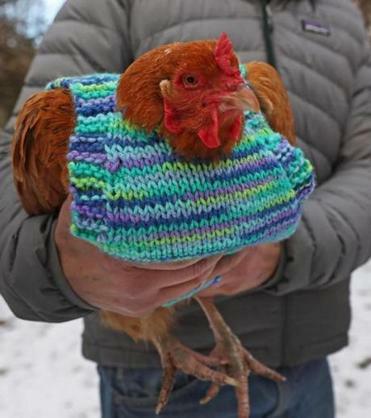 MILTON -- At first, the knitters from Fuller Village thought it was a joke when the idea was hatched to make miniature, fowl-shaped sweaters for the chickens living across the road at the Wakefield Estate. The lady knitters were more accustomed to creating blankets, hats, dolls, and scarves for needy children and holiday fairs. But when they learned that the birds -- especially a tiny rooster native to Malaysia named Prince Peep, who shivers in all New England seasons -- really could use some protection from the cold, the plucky women hopped right on the chick-knit task. “We are very anxious to help any community, including chickens,” said knitter Nancy Kearns. The knitting club, which has been meeting Wednesday evenings for about a decade, went online and found an English pattern for “chicken jerseys.” They translated it into American knitting jargon, and, in about a month, produced a dozen chicken sweaters in assorted sizes and colors. In January, the women ventured across Brush Hill Road to check out how their handiwork was working. They found a flock of cold biddies -- and a few chill roosters, including Prince Peep -- modeling the designs and clucking and crowing with appreciation. 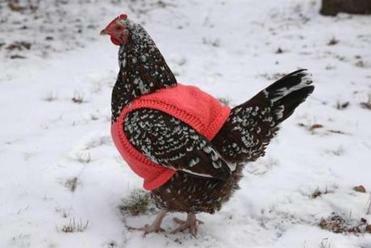 “Oh, my gosh, it really fits,” Rosemary Gelep exclaimed as Erica Max carefully slipped an orange sweater over a chicken’s head and wings and buttoned it securely. Max, who runs the education programs at the nonprofit estate, had equal success fitting Phyllis, a white-crested, blue Polish hen with a puffy headdress of feathers hiding her eyes, into a light blue number. The Wakefield Estate chickens, roosters, and hens are a breed native to Malaysia and they shiver even in August. However, a reddish brown hen ran into trouble in her blue, purple, and green jersey, catching one leg in it as she hopped around. “It’s a length issue,” Max said as she extricated the flailing chicken from the soft material, and the knitters took notes for alterations. Prince Peep’s lilac model also was a tad too large, but that didn’t stop him from strutting around in the muddy snow. Originally named Princess Peep by the preschoolers at the Adams Street Early Learning Center in Milton, where he was the sole egg to hatch out of two dozen donated by the Wakefield Estate about two years ago, he is a Serama chicken and seemingly unfazed by his tiny stature. “He has a lot of attitude,” Max said. Max showed the women how to hold the birds -- “like a little football, keep the wings in, and let the legs drape” -- an instruction she uses with the approximately 2,000 school children who visit the Wakefield Estate each year. To that end, the estate holds various workshops in topics ranging from archaeology to mushroom growing, and enlists the nearby Thacher Montessori School to run the estate’s chicken coop as an ongoing lesson in animal care and business management. One thing students quickly learn is that chickens periodically lose their feathers, or molt. “It’s not a good look; it’s really quite hideous,” Max said. Plus, if they molt when temperatures drop, the featherless fowl are vulnerable to the cold, she said. That in addition to her worries about Prince Peep’s constant shivers got her thinking about pictures she’d seen online of chickens in sweaters. She mentioned it to Kearns, who she knew was involved with community service projects at Fuller Village and with the knitting group. An independent living facility for seniors, Fuller Village is also on the grounds of a former estate donated by a local family. “We never thought anyone would actually make [the sweaters] for us, but the ladies stepped right up,” Max said, adding that she anticipated using all of the handmade items.